Please Note: This review is based on the original 1994 PC game, for the 2013 updated version, our review can be found here. In 1994 the first-person shooter was rampant. Like today, you just couldn’t look over a rack of games without a large number of the genre present, although at this time they were simply known as “Doom clones“. 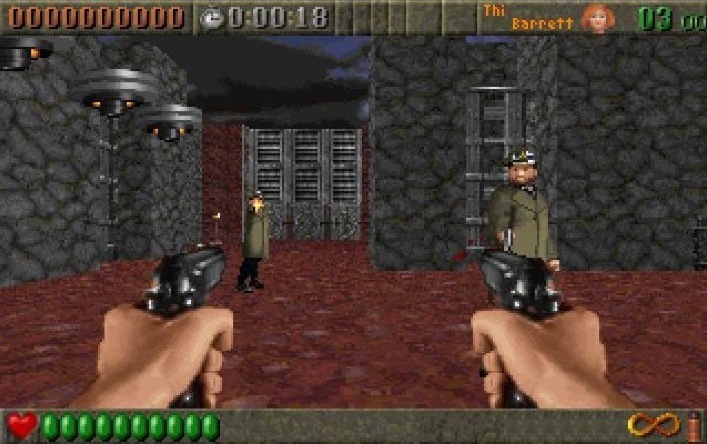 Ironically, one of the craziest of these titles, Rise of the Triad (ROTT), was played by almost no one unless you were like me and relied heavily on free shareware titles. People keep thinking they’ve played it, but once I start describing it quickly discover it’s a different game. It’s basically a Wolfenstein 3D-like title, which makes sense because it started life as the sequel, and focuses on graphic violence, crazy traps and platforming, and plenty of different explosive weapons. You play as one of five members of spec ops group H.U.N.T. (High-risk United Nations Task-force), each has a value of 1-5 in either strength and speed that balances to the same total amount for each. It’s not as diverse as it sounds in terms of character class, but it allows mild adaptation to your play style. In the game H.U.N.T finds itself trapped on an island after a rescue boat gets destroyed and your goal is simple: kill.